Philip had to come through a port in America. 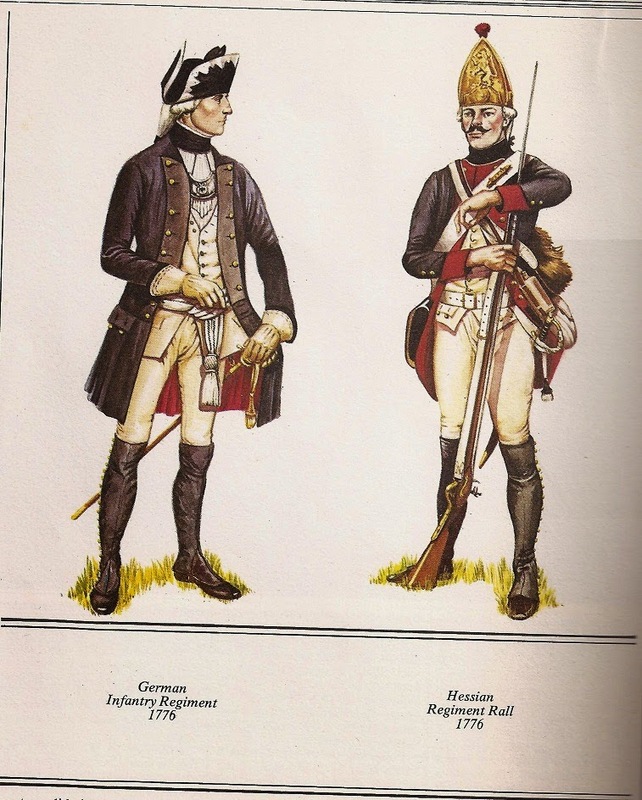 He did so through the port of New York with the 3rd Waldeck regiment in 1776. 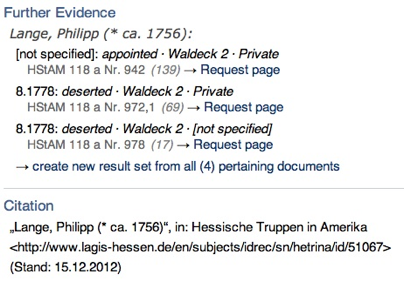 The following screen capture was made from a query at ANCESTRY.COM. with the German 3rd Waldeck regiment. 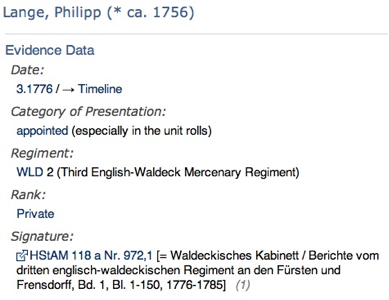 Philip was consequently a 3rd Waldecker soldier. 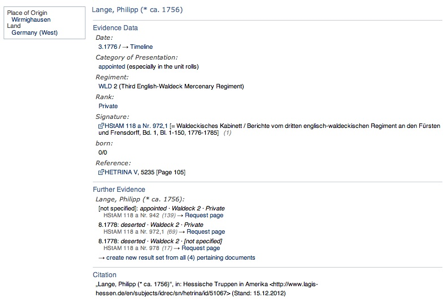 From the Marburg Archives where the military files of these regiments are stored, I came across the military file of Philipp Lange. Here is a screen snapshot of it. 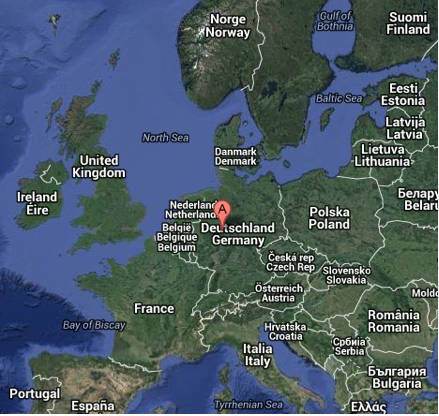 Where is Wirmighausen located? I guess it will be more convenient for you to find it through GOOPLE MAPS. But, here a screen shot that will help you locate it in Europe. On a military file, we learn that he was living in Wirmighausen at the time he was a soldier in the 3rd Waldeck regiment. Was he born there? Do we have birth certificates to his name? I must advise you in advance that, for instance, the name Johann Philip Lang is the name given at baptism. The individual will go on in life as Philip Lang. 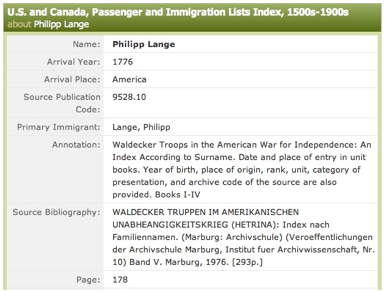 Even though our ancestor signed his name as Philip Long, it means that we have to search in Germany for Philip Lange, or better, Johan Philip Lange. 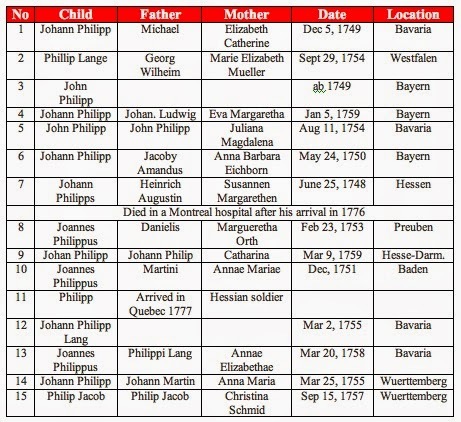 The Longs in Germany were very scarce in the 18th century. If you work with ANCESTRY.COM, the result will look like the first screen capture. If you work with LDS, the result will look like the second capture. You have surely noticed that there is no birth certificate that seems to match perfectly the data on his military file. First, the military file is not sure about his exact birth date: it could be 1756 or 1757. Second, on a passenger document, it says roughly the same thing: about 1757. Getting the exact date of his birth could very well a monumental task due to the distance and language barrier that separate us from Germany. Nevertheless, I think it is just a matter of putting the right resources at the right place, and it will get done. At least, we know where he was living in 1775.